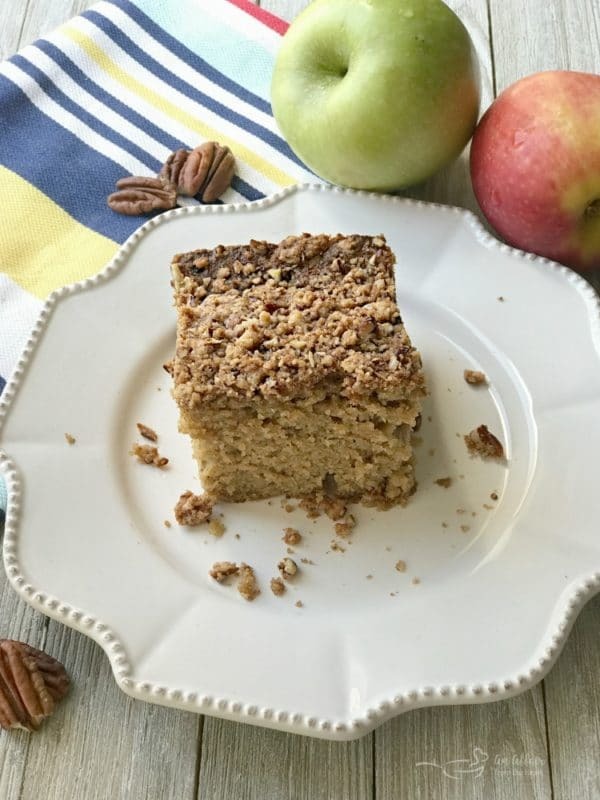 Applesauce Coffee Cake - cinnamon spiced with buttery pecan topping. Moist spiced applesauce coffee cake, topped with a buttery streusel topping made with pecans. 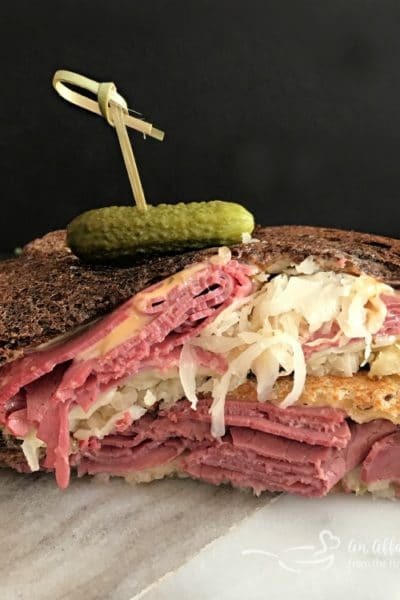 Perfect for brunch, or anytime snacking. Coffee cake is one of my favorite brunch items. There is just something about the combination of that and a strong piping hot cup of coffee. Best part of coffee cake in my opinion? That topping!! 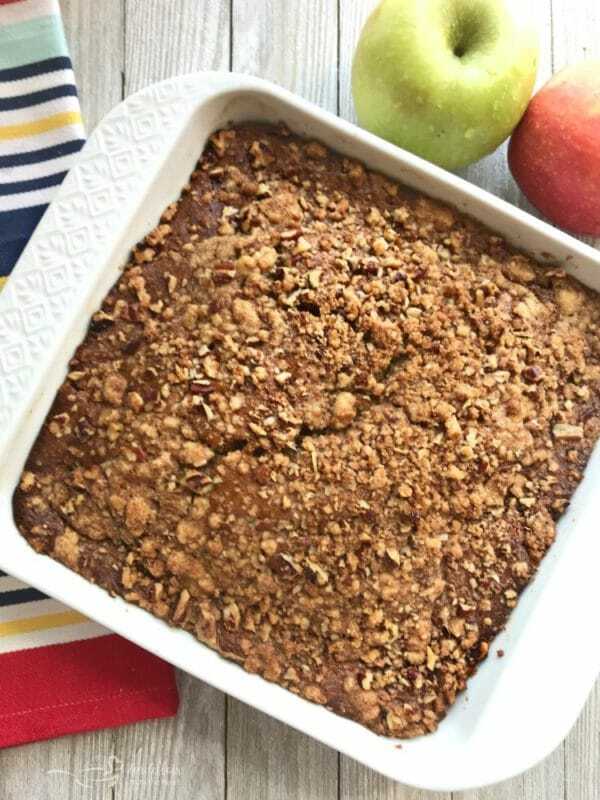 This Applesauce Coffee Cake has everything I love — moist spiced cake, and a delicious crunchy topping! Have you heard?? 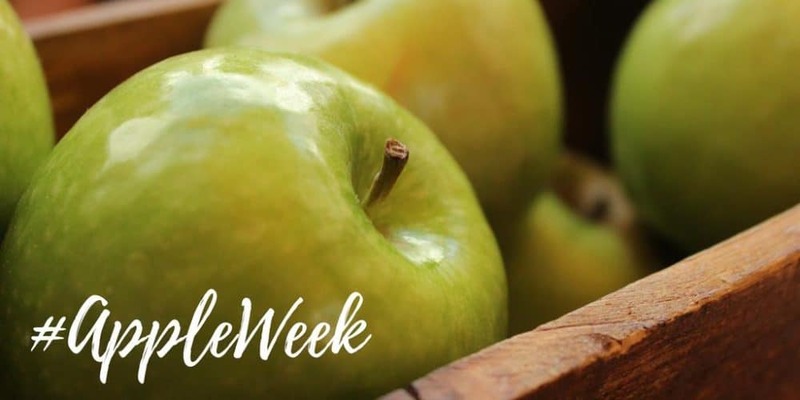 It’s APPLE WEEK! What’s apple week? 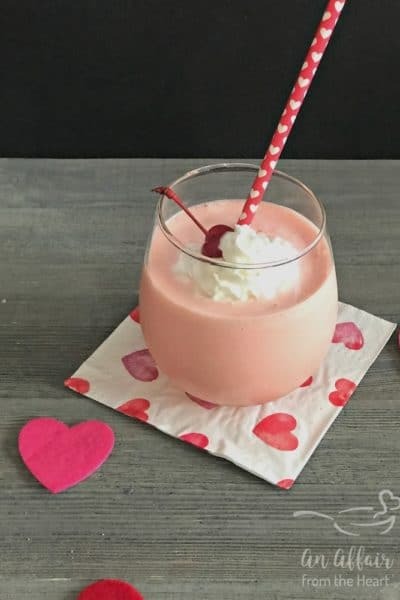 It’s a fun week that has been put together by Carlee from Cooking with Carlee, a whole bunch of food bloggers get together and for a whole week, we share TONS of apple recipes!! I have already shared one, my Fresh Apple Granola, and I have one more to come, My DQ Apple Pie Blizzard. 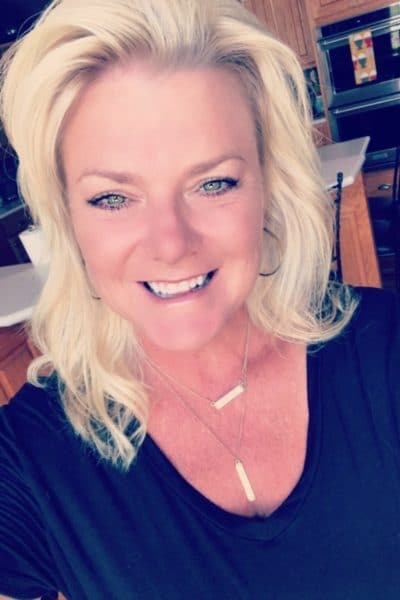 Carlee worked with some very sweet and generous sponsors, and they not only gave us products to use in our posts, but they have given some really awesome prizes, too! If you’d like to read about each sponsor and what they contributed for prizes, you can check all of that out here. Want to enter to win?? You can do that right here!! 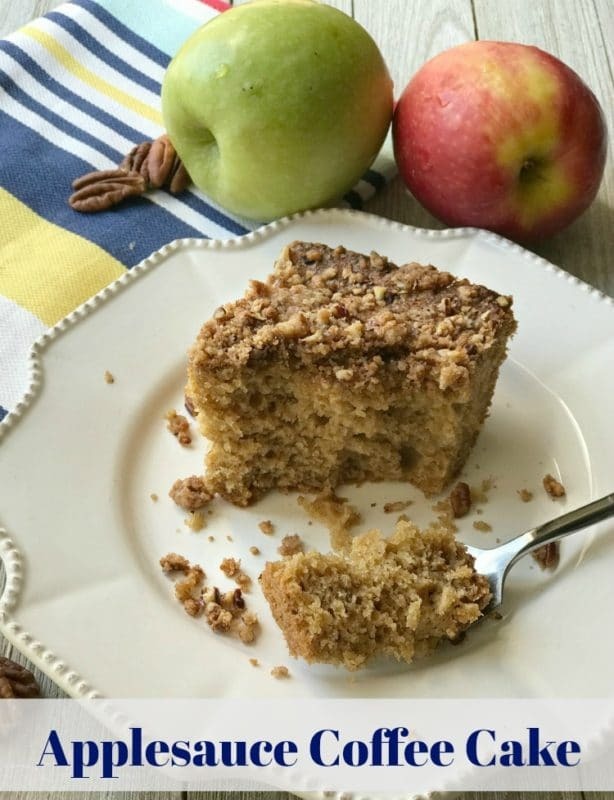 For this Applesauce Coffee Cake, I used light Imperial Light Brown Sugar in both the cake and that dreamy crunchy topping! Imperial Sugar is always so generous with us for events like these! They shipped me a whole box of brown sugar and granulated sugar, plus a super cute apron and baking mat. 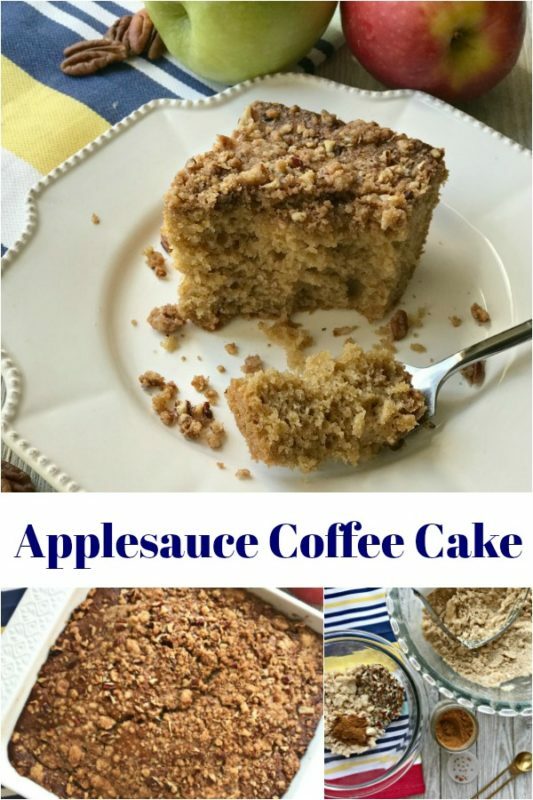 What DO I need to Make This Applesauce Coffee Cake? 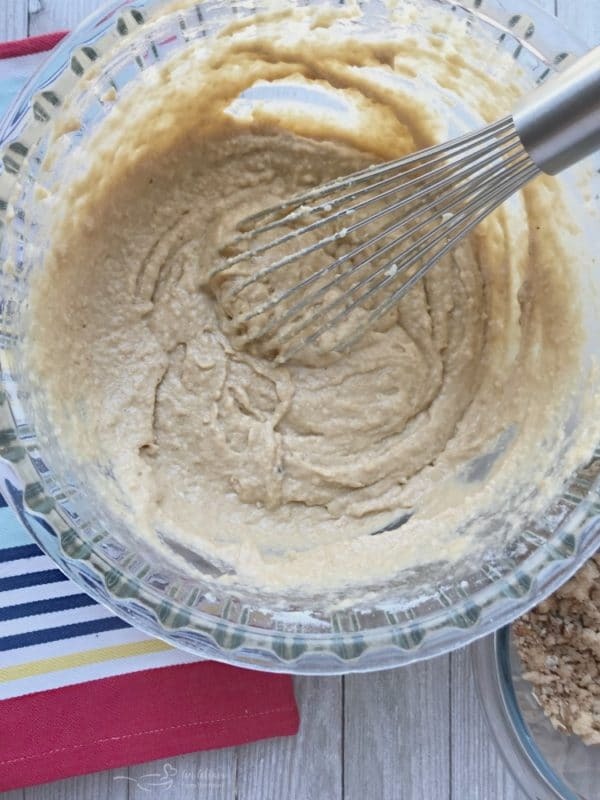 In a bowl, combine flour and brown sugar, cut in cold butter with a knife or a pastry blender. 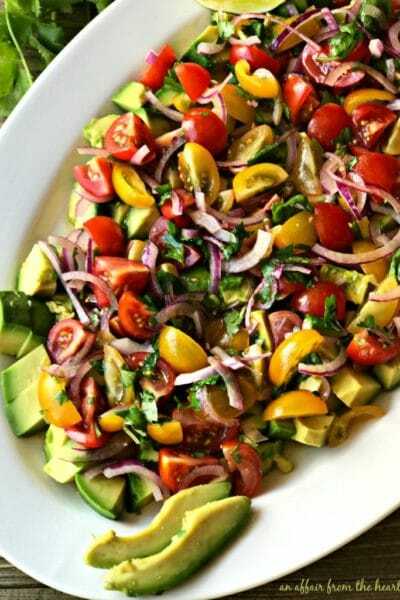 Remove 1/2 cup of this mixture and place in a smaller bowl. Add to it, pecans and cinnamon, this is your topping. Set aside. 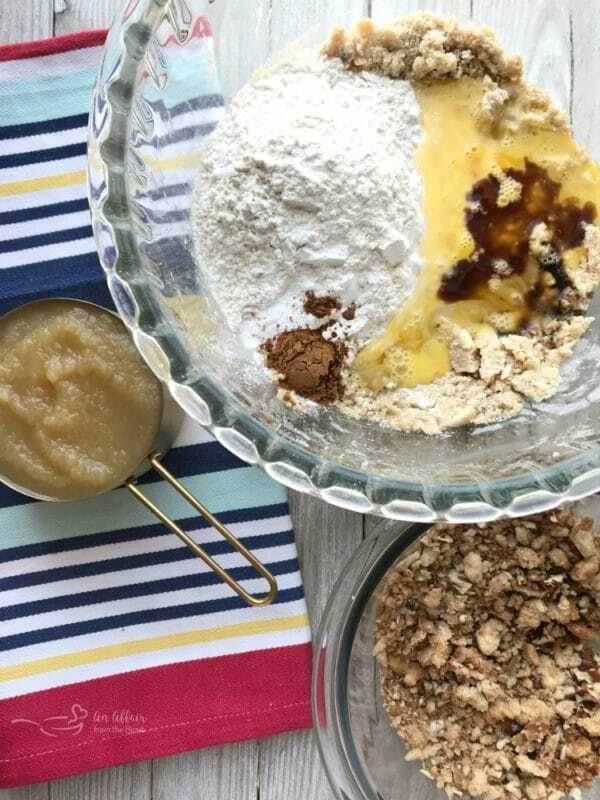 Add in remaining flour, baking powder and soda, eggs, applesauce, vanilla and cinnamon. Beat until well blended. Pour the batter into a 9×9 baking dish and sprinkle with topping. Bake for about 30 minutes. Take a deep breath in, fill your senses with the aroma of this delicious Applesauce Coffee Cake. Pour Yourself a nice cup of coffee and slice yourself a piece and enjoy it while it’s warm. You deserve it. 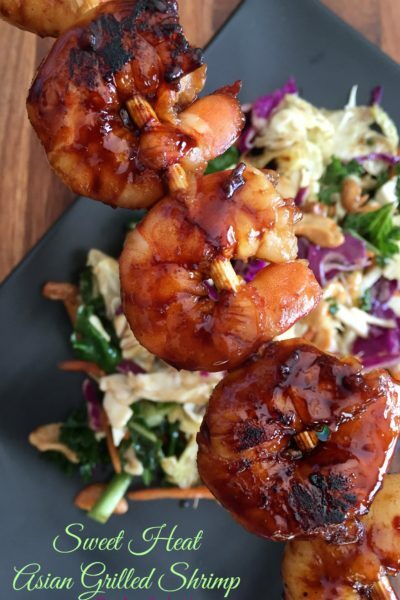 Do you love apple recipes like WE love APPLE RECIPES?? 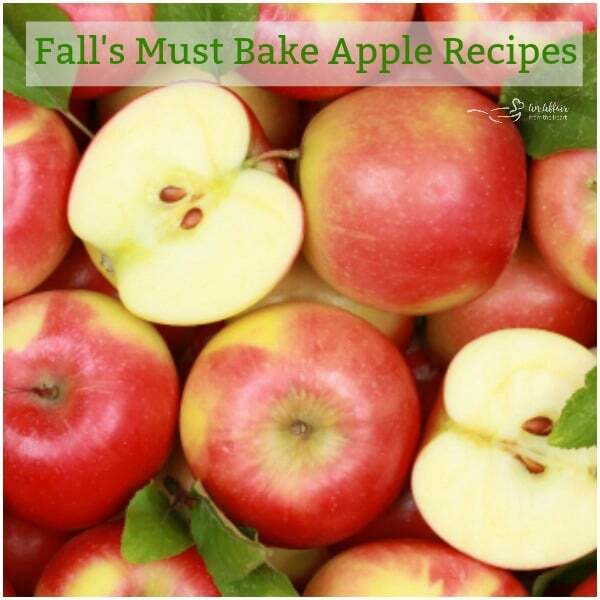 Here is a list of Falls MUST BAKE APPLE RECIPES for you to browse. Here’s a List of what all of the Other Bloggers have for you today! Shall we get to the recipe? Yes, yes we should! Preheat oven to 375 degrees. Spray a 9x9 baking dish with non-stick cooking spray. 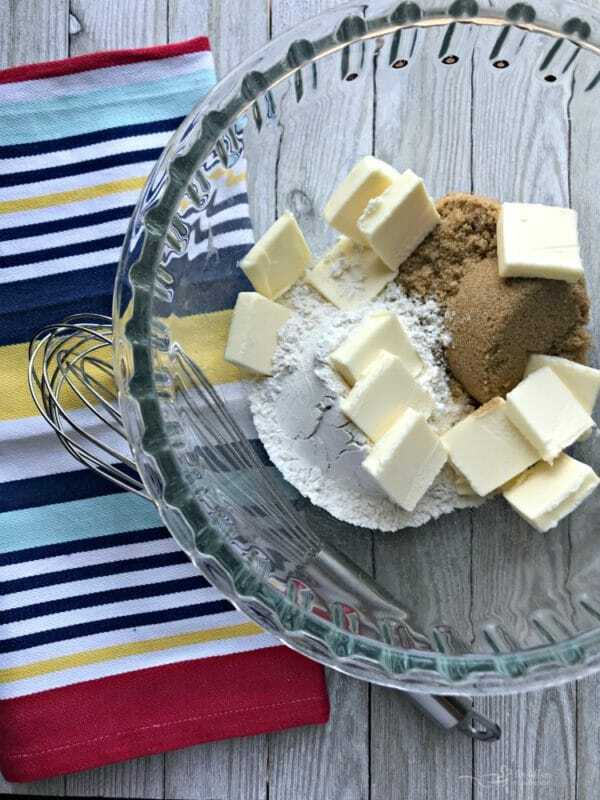 In a bowl combine butter with brown sugar and 3/4 cup of the flour. Using a pastry blender until it becomes crumbly. 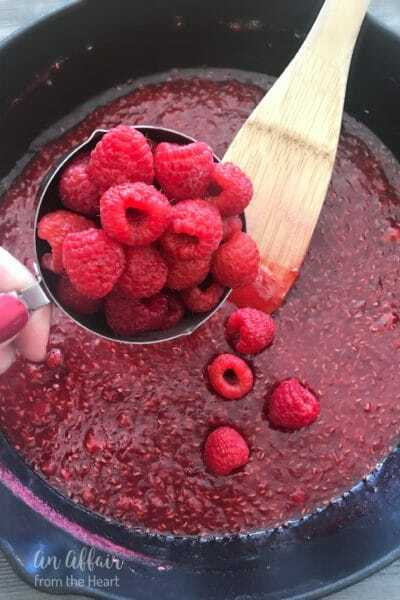 Remove 1/2 cup of mixture and place it in a small bowl. Add to it the chopped pecans and 1/2 teaspoon of cinnamon. mix to combine, this is your topping. Set aside. Add to the remaining mixture, the rest of the flour, baking soda and powder, the rest of the cinnamon, eggs, vanilla and applesauce. Beat until smooth. Pour into prepared dish. Bake for 30-35 minutes or until toothpick inserted in center of the cake comes out clean. I would love a piece of this with my morning coffee. I love that you use cinnamon applesauce in the recipe. 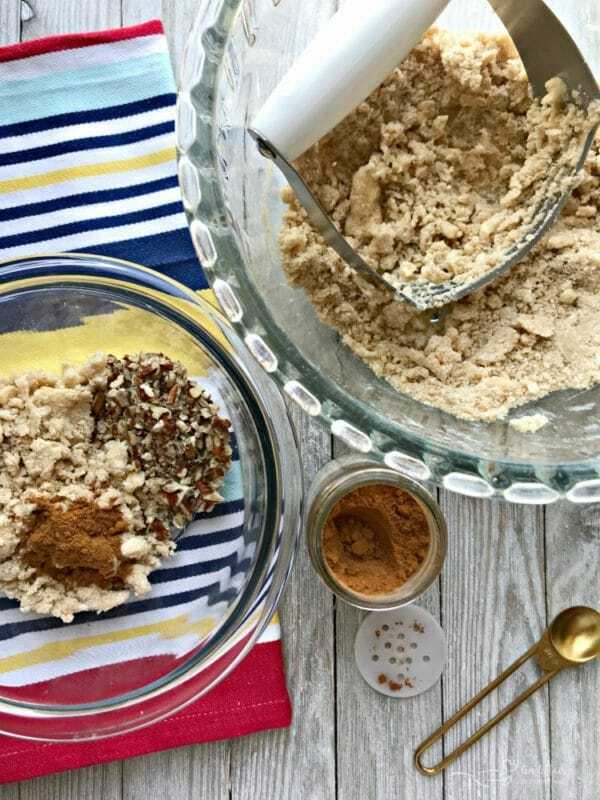 I bet it adds lots of flavor and keeps the coffee cake moist! 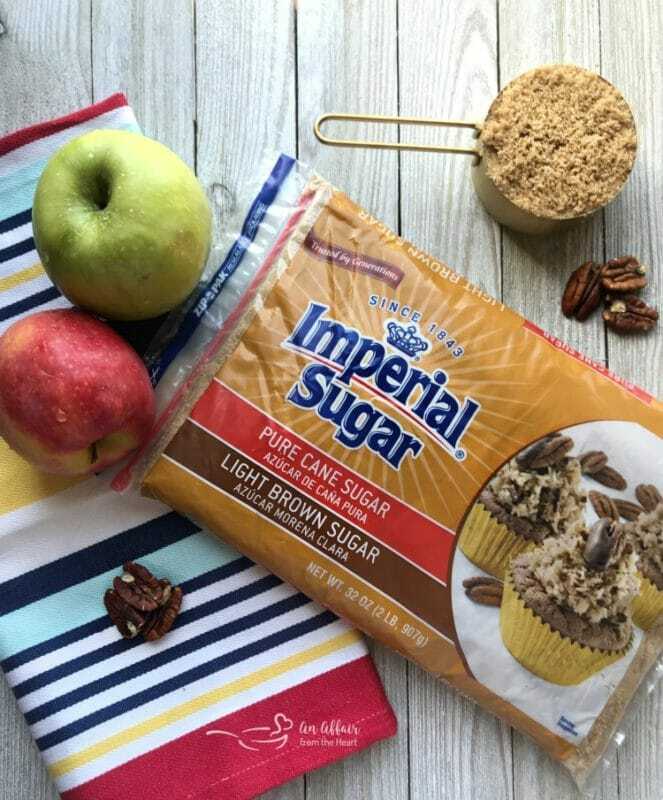 I am a sucker for anything with a crumb topping… and cake… and apples, so I guess you have me on all fronts here!